A prize-winner at three of the most prestigious international violin competitions - the Tchaikovsky Competition in Moscow, Queen Elizabeth in Brussels and the Indianapolis - Marco Rizzi has soon been recognised as one of the most interesting young violinists of his generation and was awarded the Europäischen Musikförderpreis on the recommendation of Claudio Abbado. Marco Rizzi is regarded as one of the most appreciated musicians from Italy. He regularly appeared in leading concert halls such as Teatro alla Scala in Milan, Salle Gaveau and Salle Pleyel in Paris, Lincoln Center in New York, the Concertgebouw in Amsterdam, the Philharmonic Society of Brussels, the Great Hall of Moscow Conservatory, the Hamburger Musikhalle, the Berlin Konzerthaus and the Tivoli of Copenhagen. He worked with such notable conductors as R. Chailly, G. Noseda, A. Ceccato, P. Eötvös, V. Jurowski, S. Denéve, G. Neuhold and was soloist with orchestras such as the Staatskapelle Dresden, Indianapolis Symphony Orchestra, Netherlands Chamber Orchestra, Royal Liverpool Philharmonic, Hong Kong Philharmonic, Orchestre de Concerts Lamoureux, Rotterdam Philharmonic, Orquesta RTVE of Madrid, BBC Scottish, Netherlands Philharmonic, Orchestra Sinfonica di Milano 'G.Verdi', Radio Chamber Orchestra Holland, and many others. Marco Rizzi resides in Germany, leading an international class first at the Hochschule für Musik -Detmold (Germany) (1999 -2008). In October 2008 he was appointed at the Hochschule für Musik in Mannheim and since September 2007 he is also professor at the renomated Escuela Superior de Musica Reina Sofia in Madrid. His students have been prize-winners in important international competitions. 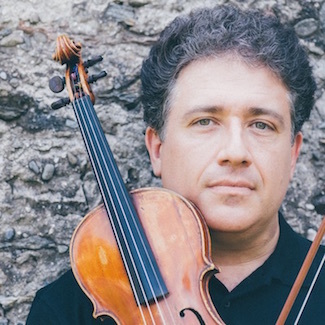 He is also regularly serving as juror in some of the most prestigious violin competitions, such as the Queen Elisabeth Competition (Bruxelles), the Joachim Violin Competition (Hannover) or the Paganini Violin Competition (Genova). Marco Rizzi plays on the “Baron Knoop” 1743 violin by Pietro Guarneri, owned by the foundation “Il Canale” ONLUS.